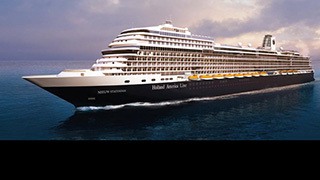 Following an inaugural season in the Caribbean, Holland America Line’s Nieuw Statendam will cross the Atlantic in late APR 2019 to spend the summer and fall exploring northern Europe and the Mediterranean. The new Pinnacle Class ship will homeport in Amsterdam, the Netherlands, for the summer. Offering seven- and 14-day itineraries to the Norwegian Fjords, the Baltic, Iceland and North Cape, Nieuw Statendam will visit some of the most scenic and culturally rich ports in the region. In September the ship will head to the warm waters of the Mediterranean on a 12-day cruise from Amsterdam to Civitavecchia (Rome), Italy. Three 10-day cruises roundtrip from Civitavecchia will explore the eastern and western Mediterranean. The ship will then depart Civitavecchia 27OCT for a 14-day cruise back to Fort Lauderdale, Florida.